Andy Hui Chi On, Gordon Lam Ka Tung, Janice Man Wing Shan and Jacky Cai Jie two nights ago attended the NESSUN DORMA (HUNG SAU WAN MEI SHUI) premiere. The event was scheduled for a noon start but due to the Number 8 Storm Signal it was postponed until the evening. On Jai said that originally since the signal cancelled the premiere two days ago, he drove to the supermarket to shop. "I was very happy to shop at the supermarket. I brought a steak home to cook. I didn't expect that I would have to attend the premiere at night and I wouldn't get to eat it yet." 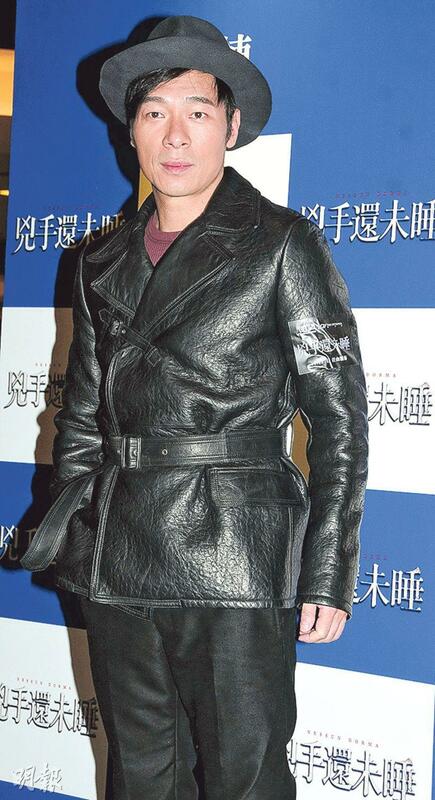 He said that earlier with Ka Tung, JM and the director promoted the film in four Mainland cities. He mostly ate popcorn and had cola. He thought that he could eat a little better. Ka Tung also complained that the Mainland promotion was very tough. He did not have time to eat. He only "sustained his life" with popcorn, hotdog and coffee. How was the health of On Jai's wife Sammi Cheng Sau Man? On Jai said, "She is much better, but she still needs to rest a little more. (will you make her soup?) I don't know how, learning it now is too late. I told her to be quieter when she watched television. I knew that she was anxious to recover, so she did not need to say too much." JM has been made fun of for mixing her Chinese with English in her conversation. "I will pay more attention. I am an ordinary person, I have bad habits too. I will change." She revealed that many friends would send her reports and she laughed them off like a joke.